Aged 16-21? Do you want more from guitar? Ensemble playing is something that other instrumentalists take for granted. Being part of a strong team, making music that far exceeds what one guitarist can do, is a real buzz. Here in hago we perform regular concerts to audiences from 50 to 1250 in size. We're keen to extend this opportunity to talented local young players, sharing our unique experience with the players of tomorrow. If you're 16-21 years old and Grade 5 or above, or you're teaching someone who fits that description, read on! We can offer two young players a taste of hago - a 6-month placement for only £35. Join us permanently at the end if you want! We've designed this opportunity to complement your solo lessons - it won't interfere with them. Derek Hasted - potted biography here - has a master's degree, a teaching diploma and a CRB enhanced disclosure check. 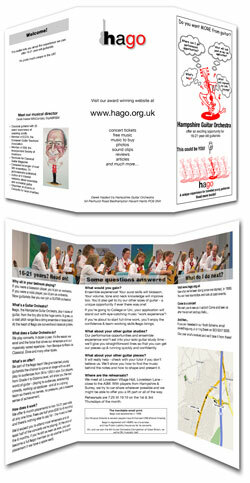 For more information download our 3-fold leaflet in PDF form - it's got much more information and contact details too!